Part 2- Where did this begin? Back around 2001-2002, while pondering my old cargo box trailer, I was thinking a lot about rolling homes and nomadic vehicles. My work over the years has given me a lot of travel experience and I camped often enough in and out of my full-sized Ford truck for many years. There was very little on the subject of homemade towable vardos on the web back in the early 2000s; in fact, I could find almost nothing at all at the time. However, there was some information about Teardrops, Benroys, and hippie-style bus and truck conversions which got me started with some direction. 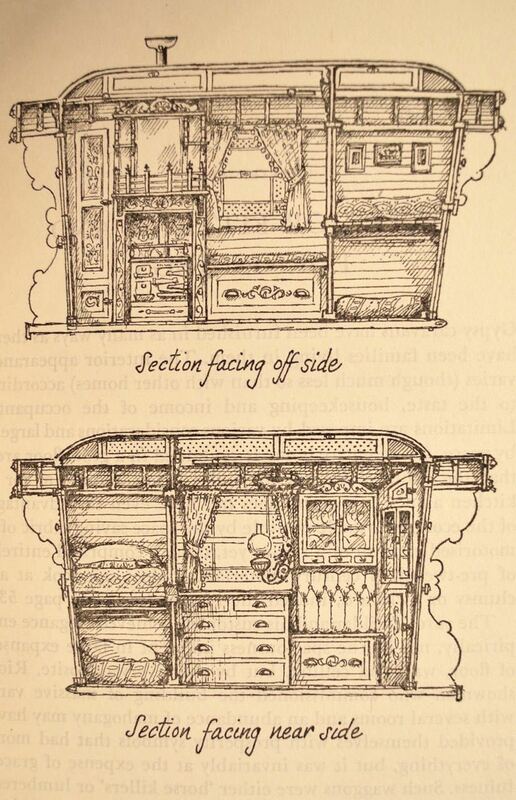 The little information I found about old-style “gypsy” caravans impressed me greatly as this design appeared to solve all the problems of layout and space conservation. Also, (prior to the Steampunk movement having a name) I think I was drawn to the aesthetic that evolved in nineteenth century design. 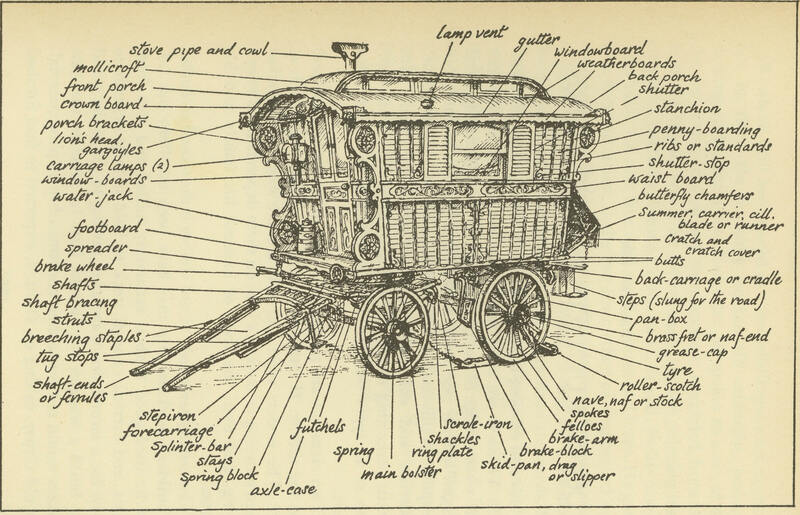 Though not actually created by the travelers themselves, these living wagons were being created by a few ingenious builders in Britain who combined beauty with practicality in creating a luxury space for those who could afford it. Parallel to this, the Continentals and Americans were creating their own versions of rolling homes in the form of Conestogas, Roulottes, Sheepherder’s, and Showman’s wagons which provided a more pragmatic sensibility for my limited ability and means. Surely, the Sheep wagon is the close cousin to the Irish Bowtop or Open Lot. I read all I could about these innovative designs but, at the time, there was very little on the internet and books with such information were rare. I sifted old “Popular Mechanics” type articles and read what I could find about early home-built RVs. 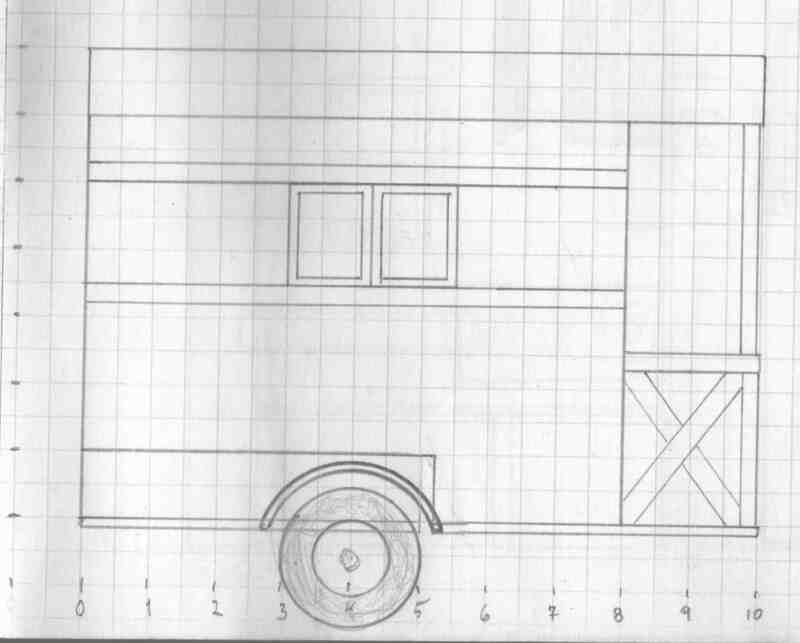 Mother Earth News had an old article about sheep wagons with schematic attached. Then there were my own, very real limitations. I had very little money for the project and even less time to spare. Finally, I had no real workshop or covered facility in which to construct this thing and I would be starting in January on the High Plains. Honestly, I had my doubts about the sanity of the whole project. Winter on the Llano Estacado. The only thing not visible here is the wind. My rough design was certainly not perfect but fit within the very tight parameters I set for myself, including my limited budget. Small, light, and relatively cheap were as important as the aesthetics and traditional building techniques. Unlike modern RVs where people may spend large quantities of time inside the structure, I wanted this to be used more like early pioneer or “Gypsy” wagon where most of the actual living is done outside. The teardrop RV community has taken this to heart, often with a very modern and high-tech design, including microwave ovens, television and entertainment centers, and very modern kitchens. 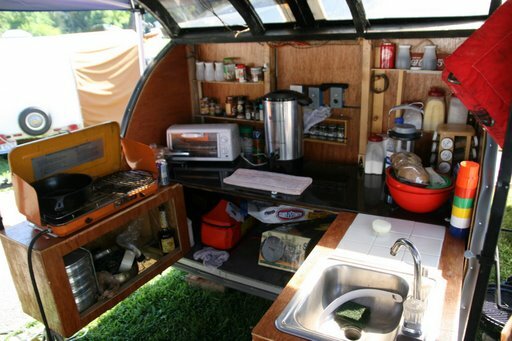 A Teardrop Galley Kitchen. From: https://teardropindependent.wordpress.com. 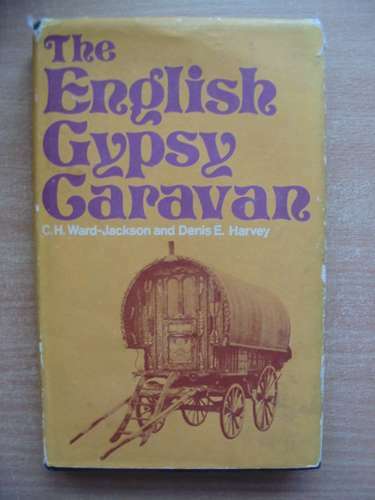 Then, I read the book English Gypsy Caravan: Its Origins, Builders, Technology and Conservation by Cyril Henry Ward-Jackson and Denis E. Harvey. This is an impressive volume documenting the various styles of living wagons from the heyday of caravanning. I thought it would be great to tow something like this behind a truck as my home. It showed the vardo in all it’s glory. 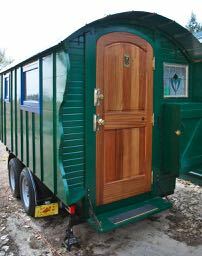 Unlike the BenRoys, the “slouchies” and teardrops I had considered the old fashioned “showman” or “Gypsy” vardo a classy look and feel that a woodworker can appreciate and all the amenities of home, even if it is rather small and spartan for modern tastes. This book was the catalyst for my dream. Once I decided that this was my route, I filled sketch pads and notebooks with ideas, designs, measurements, and material estimations. I thought small, I thought large, I guessed at weight and pondered construction techniques. * I combed old books about wagon building, and I hoarded scrap lumber and hardware. I started figuring what I could get locally and how much this thing might cost. Images like this really inspired my plans. So ended the idea of the stealth camper. I came out of the closet as a modern Traveller. The essential layout was solidified 125 years ago. There are only a limited number of combinations that meet the human needs on this sort of scale. 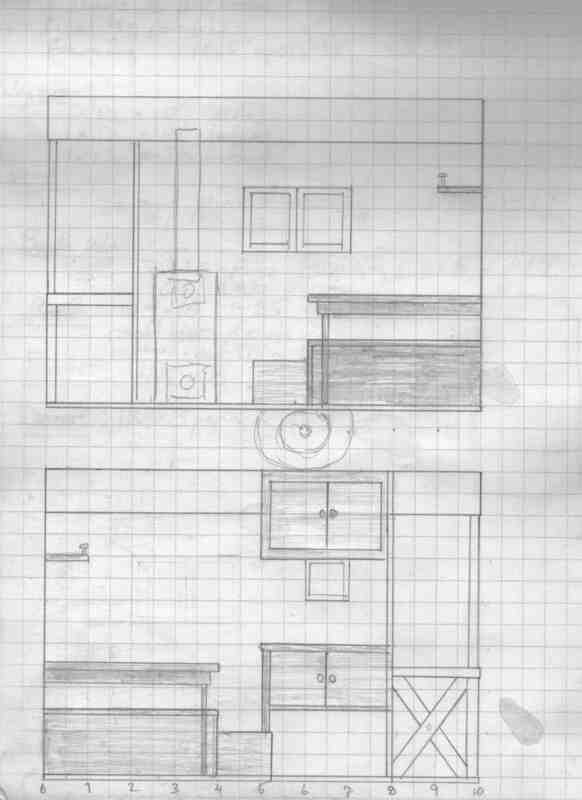 I tried every combination on paper and in models but always returned to the standard layout of bed across the rear, hide-away table, bench seats, shelving, and of course, the wood burning stove. Despite the limitations, there is some variety within these parameters and that is where the fun begins. I examined the interior above and decided that I could live there. It’s something between a Victorian parlor and a retro-futuristic space capsule. The next question was: Can I make this work at highway speeds? It seemed an unlikely but I was determined. The Internet was no help at that point as I couldn’t find anyone with a similar design online so I looked to the library. There was little help there about a modern solution but there was plenty of information documenting old-time wagons if one were willing to chase down the leads. And so it began. The more I looked at the plans, the more I thought this could really work. 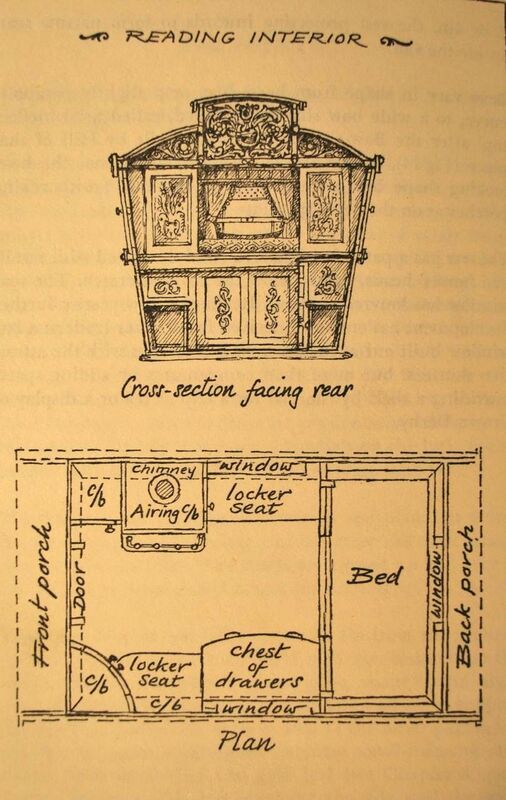 The basic floor plan of a Reading Wagon. My other limitation was the trailer base. I looked at a lot of running gear options but decided to go with what I already owned. I already owned sturdy, over-built little cargo frame that should do the trick. Could I put a ledge wagon on this sort of base? I admit, I dumbed down and simplified the 19th century workmanship to fit a modern time and budget but the classic inspirations were there. The essentials of a Reading Wagon. From English Gypsy Caravans. I’ll let you into my brain a little bit here. Below are some of the sketches that evolved over time as I took in more information and the plans grew. They went from some very humble beginnings to something close to what I have today. Some are poor designs but maybe this information will help someone come up with their own special design. Please excuse the quality of the scribbles. These were made during snatches of stolen time as ideas formed in my head. Seeing them sketched out helped solidify thoughts and eliminate things that simply wouldn’t work. The constraints in size, weight, money, and practicality were both difficult and helpful. I’m a visual person. I make a lot of sketches, drawings, schematics, and mathematical notations when I’m thinking of building something. I’m not sure where the earliest sketches of the Vardo are but I’m sure they are in one of the many notebooks I have lying around. Things I did not need affected the plan as much as things I decided did need. id est; I don’t need electricity or plumbing inside the caravan but I do want a wood stove, a stow-away table, and lots of compartments for storage. Early thoughts included a porch as seen above but it really seemed pointless when the ground will serve the same purpose. I would just be pulling around an extra couple feet of nothing. This may be the first iteration that approaches the final design. The forward overhand was removed as a consideration in towing. Forward or backward? 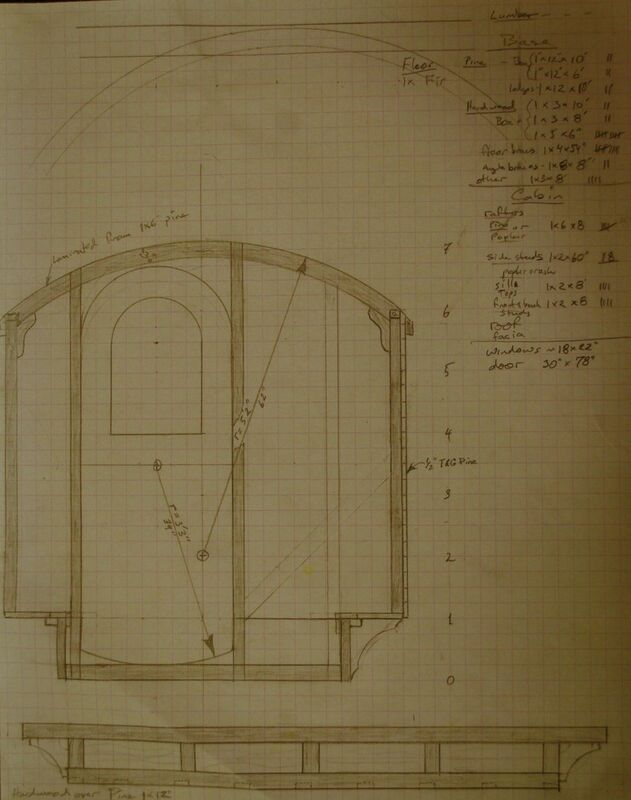 The above design had the door opening forward as with a horse-drawn caravan. There are some advantages to this but I would want a longer tongue on the frame to clear the tailgate of the towing vehicle. Also, facing forward really forces access to one side as the tongue will always be an obstruction. Although I really love the overhanging eaves these just didn’t turn out to be practical for highway speeds. I took a lesson from Sheep Camp designs and clipped the forward-facing overhang off entirely. The above and following sketches are very close to the final design. After a couple years of tweaking I felt I really understood what I wanted and why. This is probably not true for someone who uses an existing design or purchases a mass-produced product. For me, this became very personal. The above design was developed to really nitpick the space, where things would be stored, and how a human or two would fit in various activities. The dimensions are quite accurate in order to estimate necessary lumber. 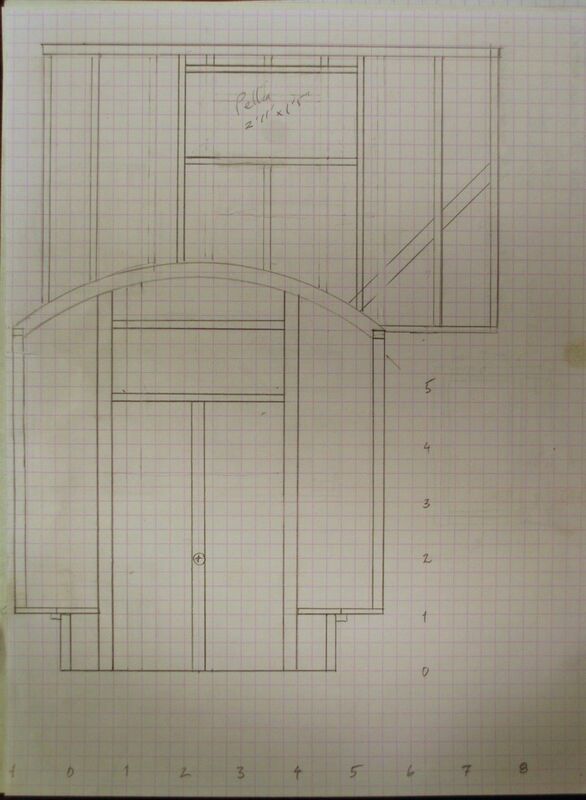 Finally, here are the final “plans” used to make the endwalls and the early framing plan, the core of the construction. That’s it… REALLY. This is where I was when I dove in, head first, with almost a week off of work, a twelve pack of beer, and a pile of wood. Click HERE for Part 3, Construction. *Modern framing techniques and materials have NO place on the road. Without substantial changes and additions, they are not suitable for the racking, jarring, vibration, and general pounding they will receive. Exterior sheeting for homes is too heavy and not really made for the vibrating abuse of the road. Fasteners must be comprised of bolts, screws, and glue, not nails. Standard house building materials will also create a structure that is far too heavy for a road-worthy wagon. Leave these techniques for outbuildings.